Once, the Rev. Rod Perez-Vega entertained a sacrilegious notion. Rather than buy 5-pound bags of Gold Medal flour, on sale at ShopRite for $1.99, maybe he could buy a cheaper brand instead. Either way, the flour is mixed with water and lard; churned into dough; stretched over mounds of hamburger meat, salt, onions and shredded potatoes; and baked into pasties, huge pastries that are shaped like footballs sliced in half. 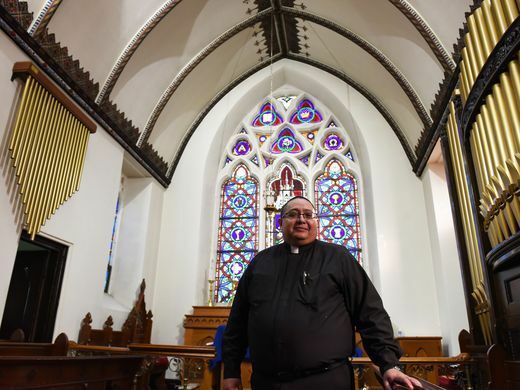 When Perez-Vega dared suggest his money-saving idea to congregants of St. John’s Episcopal Church in Dover, however, he was met with opprobrium. Members of this church have made pasties, using precisely the same recipe, since the American Civil War. Deviations will not be tolerated. Many current members grew up in St. John’s. Many view the church, the pasties and the iron mines of Morris County as a kind of trinity, inextricably linked to a shared history in Cornwall, England’s ancient mining center. Members of the church sell pasties on the first Saturday of the month six times a year through the colder months, October through April, except in January. The next sale will happen Saturday. The sale sometimes attracts journalists, who like to come to the old stone church in Dover and write stories about the immutable pasty tradition. Yet it was resistance to change that nearly killed the tradition altogether. Longtime members clung so tightly to their old ways that they drove young volunteers away, Perez-Vega said, and alienated many lifelong customers. The pasties didn’t change. The people did. Pasties and hot weather go together like Santa Claus on a beach vacation. They exist to chase away the chill. By the 1600s, workers were tucking pasties into their pockets and descending into the tin mines of Cornwall, according to "English Food," a culinary history by Jane Grigson. Pasties’ shells kept their ingredients warm for hours. Their shape, with a ring of crimped dough around the edges, meant miners could hold the pasties with dirty fingers, eat the contents without utensils, and discard the crust. Cornwall’s mines were fully exploited by the mid-19th century, and many workers from the region were recruited by mining companies in northwest New Jersey, said Wasco Hadowanetz Jr., a Sussex County historian. Cornish miners founded the Episcopal Church in Dover in 1852. Their wives and daughters founded a women’s guild, which baked pasties. Men started contributing only in the 1970s, when the guild disbanded as more women pursued their own careers, said Nancy Adamczyk, a former guild member. “My mom, my grandmother, my great-aunts all did this,” said Adamczyk, 70, of Madison. After that, the tradition seemed to calcify. Pasty dough can be tricky to seal around a huge mound of potatoes and meat. Volunteers began to criticize one another's technique, and many quit. Every volunteer had to carry heavy bowls of ingredients from the kitchen, including seniors who used canes and walkers, Krause said. And with no system to track orders, volunteers had no idea how many pasties to make. Some months they ran hundreds of pastries short. So they imposed a limit: Four pasties per person. Sales plummeted. Pasties, formerly a major fundraiser, were bringing in $300 a month, Perez-Vega said. The congregation also was growing more diverse, but you couldn’t tell by sitting in the pews. Beginning with an influx of Puerto Ricans to Dover in the 1950s, and continuing with immigrants from elsewhere in Latin America, the church had attracted enough Latinos by 2013 to host one Sunday service in English and another in Spanish. Some Latinos joined in the pasty tradition, Perez-Vega said. Still, the church’s divisions made him uncomfortable. At 12:30 p.m. on a recent Saturday, Rick Heidtman opened a slot in the face of a black Blodgett oven. He pulled out a tray of pasties, placed them on a table in the middle of the church kitchen, reached into his apron pocket and pulled out a handheld counter. With his thumb he pressed the machine’s button three times, bringing the count to 178 pasties completed since baking began at 9 a.m. The changes suggested by Krause and Perez-Vega in 2014 were simple. Runners — preferably people without walkers or canes — were assigned to carry the heavy stuff. Volunteers were assigned to call regular customers days before the sale to see how many pasties they wanted, and enter all pre-orders into a spreadsheet. The spreadsheet came in handy during November’s sale. At 9 a.m., Perez-Vega noticed orders for 358 pasties, but only enough ingredients to make 320. Someone was dispatched to a nearby grocery store. “With just a few tweaks we were able to make things run a lot more smoothly,” Krause said. All the mines in North Jersey closed decades ago. Nobody needs to carry pasties in their pockets anymore, so most elder members of the church loosened up about pastries’ appearance. They accepted bigger changes, too. Perez-Vega now celebrates a single Mass, switching back and forth between Spanish and English. Nobody seems to mind, he said. The tradition's heart continued unchanged. At the next sale, this Saturday, customers can pick up their pastries at the church between 12:30 and 2:30 p.m. Pre-orders are not required. But if you'd like to buy a pasty without calling ahead, it helps to arrive early, and bring cash. Pasties cost $7 apiece. "I buy 10 at a time and freeze them. That gets me through the month," said Robert Miller, 83, a Dover resident who arrived for the November sale at 10 a.m. "I came early so I could get a place to park." One of the volunteer bakers that day was Dottie Cygon. She ate her first pasty in 1932, when her parents moved to Dover and joined the church. She was 5.